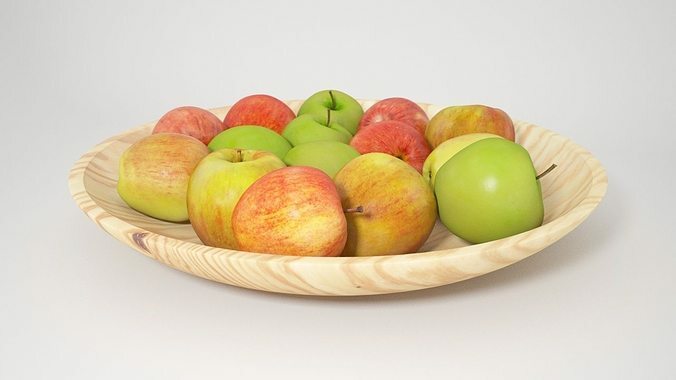 This apples set includes three different fruit bowls (wood, metal and porcelaine) each with a bunch of realistic apples. The apple models include 5 different model variations, each with individual textures and materials applied. The apple models are available as low poly models with turbosmooth modifier added to get more detail for close-up views. Each apple model and texture is different so you can get more variation in creating new sets for realistic visualization. For the hires models, Proxy files are included for VRay, in case you want to save RAM and polys in your scene. The scene files are prepared as 3Ds Max 2010 scenes including materials for VRay. POLY COUNT (turbosmooth off): All apples with bowl I - ceramic: 20.622 polys All apples in bowl II - metal: 11.915 polys All apples in bowl III - wood: 52.481 polys Apple v1: 540 Apple v2: 942 Apple v3: 1231 Apple v4: 540 Apple v5: 406 Apple cut in half: 436 --------------------------------------------------------------------------- DOWNLOAD: 47 MB (.zip archive) including preview renderings, all scene files, textures and vray meshs.